Well I wasn’t planning on filming it, but after coming home from an out of town trip, I realized I had a good view and my gear with me, so I went out and capture of few shots. I’ve never captured night sky before, and living in a metro area, the sky are simply pure black. I shoot using the Sony FS 700 so my options were somewhat limited. I used my 100-400 canon lenses with an aperture of 5.6. I recorded most of the shots 1 frame per second and a shutter speed of 1 or 360 degrees (that’s the longest exposure I can get shooting video.) I played with the ISO to compensate for the change in the moon’s brightness. 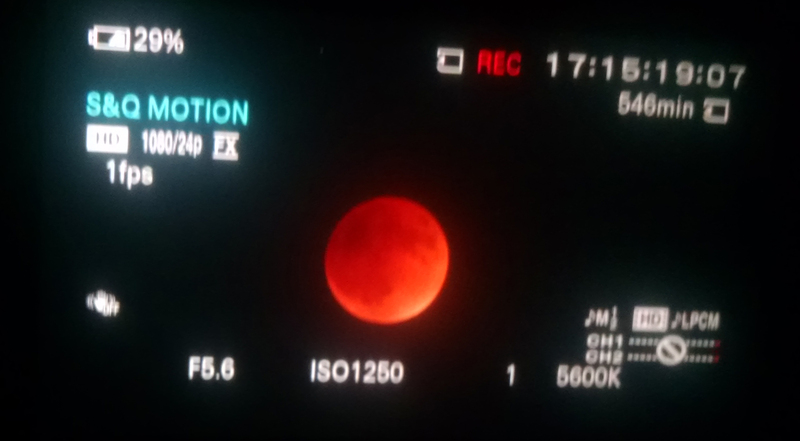 I dialed it at 1250 ISO when it was dark, it allowed for the red to pop a little more. Once the moon started coming out of the earth’s shadow, I actually used some ND filter, brought my ISO down to 800, closed my aperture to 16 and changed my shutter to 4, to make sure I could see as much detail as possible when the moon was fully bright. I’m not a big fan of using auto settings during timelapse, I rather record a few different shots at different settings and combine them in post. The final video as no color correction or touch ups, and really should have more samples to smooth the transition from red to white. Each shot was sped up in post about 400% to avoid creating a 3-4 min video.